An unidentified supporter of President Trump is restrained after attacking a BBC cameraman during a campaign rally in El Paso, Texas, Monday night. 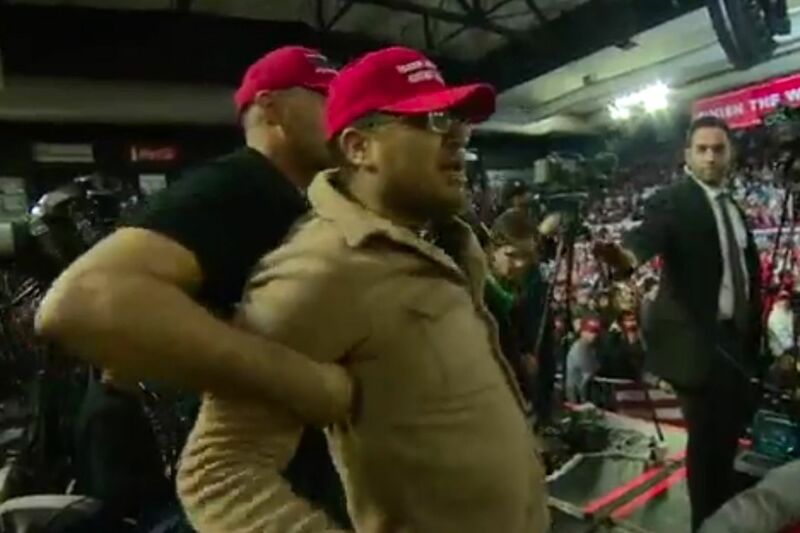 A supporter of President Donald Trump wearing a “Make America Great Again” hat attacked a BBC cameraman during a campaign rally in El Paso, Texas ,Monday night. Ron Skeans, a cameraman for the BBC, was filming Trump’s speech when the supporter gave him a “very hard shove” from behind, causing him to lose control of his camera and nearly fall off the media platform. According to the BBC, the attack came after Trump heavily criticized the media during his speech. “I didn’t know what was going on,” Skeans told the BBC. BBC Washington correspondent Gary O’Donoghue shared the video of the “shameful moment” from Skeans’ camera on Twitter early Tuesday morning, noting that his colleague was not harmed and that the protester attempted to destroy the camera. “This is a constant feature of these rallies — a goading of the crowds against the media,” O’Donoghue said during an appearance on BBC Radio, adding that he had been “spat at” during previous Trump rallies. The moment during Trump El Paso #MAGA rally last night when BBC cameraman Ron Skeans was shoved on the media platform. Despite repeated warnings from journalists and media experts, Trump has continued to label media outlets “fake news” and call reporters who cover his administration “the enemy of the people.” After pipe bombs were mailed to CNN’s headquarters and prominent critics in October, the president partly blamed the media, citing its “endless hostility” towards him and his administration.